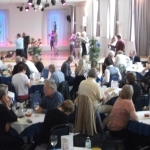 Saturday: Social dance with Ballroom & Latin American & Sequence. From 8.00 pm until 11.00 pm. Admission just £7.00 with free raffle draw each night. Please check the timetable page before traveling. Our regular Tuesday and Thursday afternoon tea dance. From 2.00pm until 4.00pm. Admission of only £5.00 includes Cream Tea or selection of cakes served with a cup of tea or coffee.